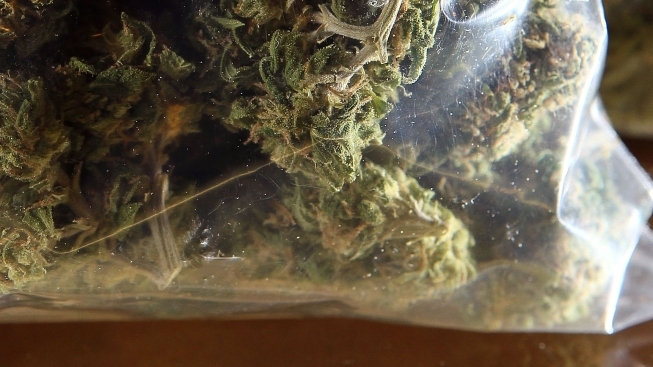 File photo of a bag of marijuana. A Baltimore man who went in for a driving test left under arrest when police say marijuana, cash and a gun were found in his car. News outlets cite a Maryland State Police arrest that says 22-year-old Reginald D. Wooding Jr. was arrested Monday afternoon. Police say he was waiting to take his test when an examiner became suspicious about an odor emanating from the car, which belongs to Wooding's mother. She contacted a trooper who was working an overtime assignment at the Motor Vehicle Administration office. A search of the car led to the discovery of nearly a pound of marijuana, a scale, more than $15,000 and a handgun with a loaded 30-round magazine. He is charged with multiple counts. It's unclear whether he has a lawyer.